2015 marks the fourth year of Mashable’s Social Media Day celebration in Addison, Texas, which occurs on June 30th. This year promises to be an even bigger and better celebration as two powerhouse events merge into one amazing conference. 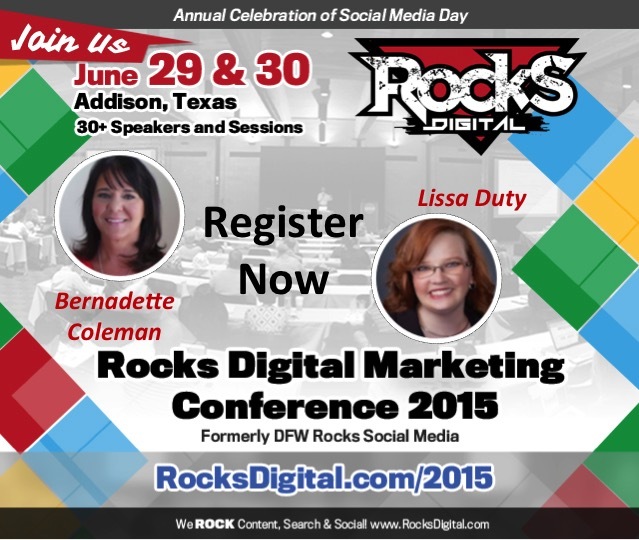 Lissa Duty, founder of the DFW Rocks Social Media Conference and Bernadette Coleman, founder of the Local Social vowed that the Dallas-based 2015 conference would take digital marketing by storm, and have worked every day since toward that goal. You can learn about the history of their events and the merging here: http://rocksdigital.com/social-media-day-history/. Together they bring much needed education, information and resources to business owners, digital marketing agencies and enterprise level service providers on the topics of Content, Search, Social and Local for Business Development. 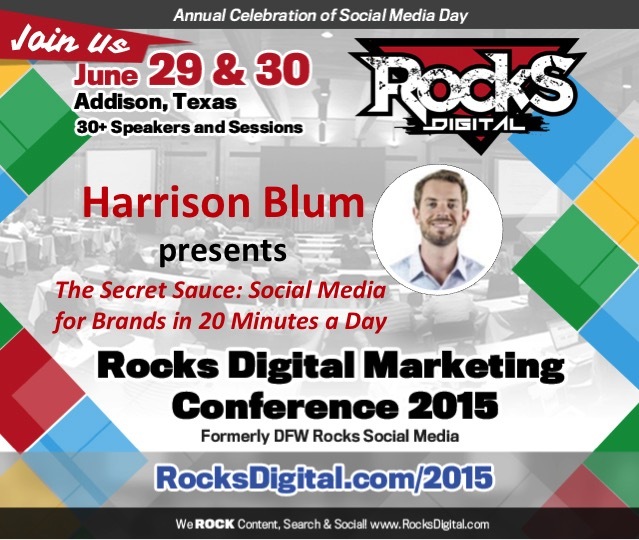 The 2015 Rocks Digital Marketing Conference will be held on June 29th and 30th (Social Media Day) at the Addison Conference Center in Addison, Texas and will feature over 30 speakers in more than 30 different sessions. On these 2 days of learning, attendees will have organized networking opportunities, which include the Vendor/Exhibitor Expo, Picnic-style Lunch, Afternoon Networking Breaks, two special after-events, the Speaker-Author Book Signing and Mashable’s Social Media Day Tweetup. A sample of the speakers lined up for this year’s conference include: Laura Armbruster | Candy Barone | Harrison Blum | Bernadette Coleman | Lissa Duty | Patty Farmer | Elayna Fernandez | Greg Gifford | Melanie Neal | John Nosal | Anthony Ryan | Brian Sullivan | Eric Tung | Randall Turner | Jeremy Vest | Joe Youngblood and many more! Lissa is keeping the names of the additional speakers secret until they are officially announced on the RocksDigital.com website. 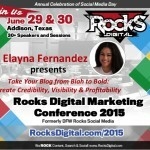 You can access the full list of speakers as they are announced and their bio’s at http://rocksdigital.com/2015-speakers. 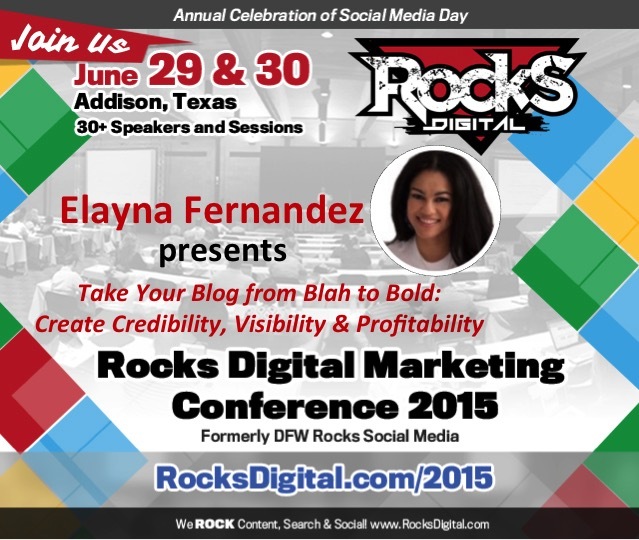 Who will be in attendance at Rocks Digital? Business Owners, Web Designers, Social Media Strategists, Brand Managers, Digital Marketers, SEO Authorities, Lawyers, Doctors, Coaches and more. Attendees will travel from all points of the United States to attend. As Bernadette and Lissa say “Together we Rock Content, Search, Social and Local and the 2015 conference will be like no other.” This is one can’t miss conference. 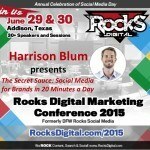 You can learn more by visiting http://RocksDigital.com/2015. 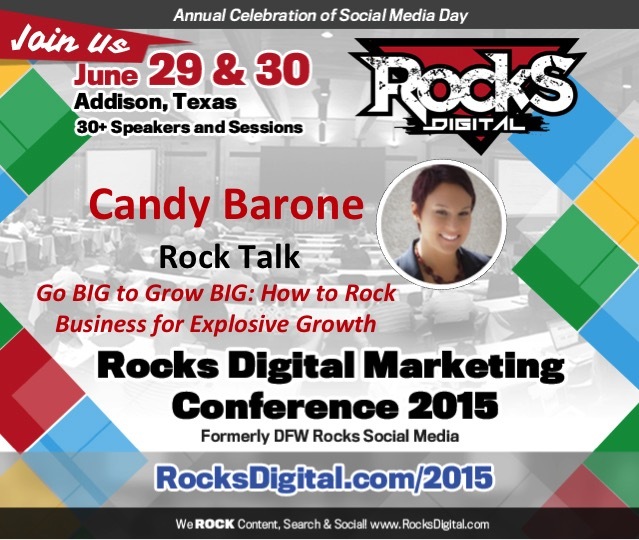 Registration for Rocks Digital 2015 has officially opened and you do not miss out on this opportunity to learn from the digital marketing industry leaders, network with the who’s who of the online world, and mingle with the other conference attendees. You can find agenda and take advantage of the early bird registration at http://rocksdigital.com/register-now/. Email Info@RocksDigital.com if you have any questions or would like additional information. 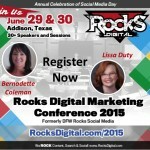 Rocks Digital, the brainchild of Bernadette Coleman and Lissa Duty, was created by merging two national events – the Local Social founded in 2013 and DFW Rocks Social Media founded in 2012. Since 2014, the mission has been to provide digital marketers, business owners and marketing, SEO, local search and content professionals with the resources, information, and insights needed to be at the forefront of digital marketing. The brand includes a resource site, an audio network, a Meetup group and proudly hosts two conferences each year. 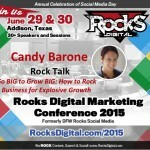 The Rocks Digital Marketing Conference is one of the largest national digital marketing conferences in the South! To learn more, visit www.RocksDigital.com or call Lissa Duty at (214) 763-4340.